HP doesn’t ship a case or even a slipcover with the HP 2133 Mini-Note. The computer comes with very little packaging, which I appreciate. But when you open the box, all you’ll find a computer, battery, power cord, and a disc or two. That’s it. 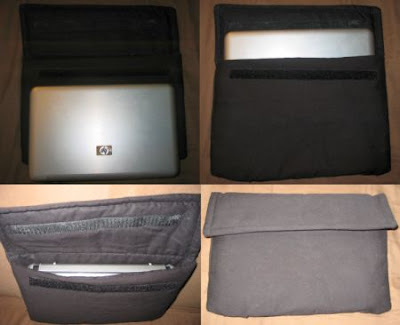 Since the Mini-Note is smaller than most laptops, if you throw it in a typical laptop case it’s going to slide around a bit and it’s more likely to get scuffed up than a 12-15 inch laptop. You might be able to find a case for a portable DVD player that’s the right size. Perhaps you could order a custom slipcover or case if you can find one. Or if you’ve got a crafty streak, or better yet, a spouse with a crafty streak, you could make your own. My wife runs an Etsy store where she sells curtains, bags, and other knit and sewn items. A while back she had been kind enough to make me a padded case for a digital audio recorder, so I asked her to make me a padded case for my Mini-Note. My computer fits snugly in this case, which I can then throw in a backpack or other bag without worry. Farrah doesn’t plan to make laptop cases on a regular basis, but you can check out some of her other items at her Etsy store. I ordered a slip case from Waterfield Designs for my Mini-Note. I highly recommend it. The thing fits like a glove, it’s durable and it looks good. Brad, Maybe you could simply post the pattern and sewing instructions so that those who sew or have a spouse who sews could make one. By the way, many thanks for all your work in keeping us up to date with what’s happening in the ULPC field. I especially like the even reporting without taking sides in Eee vs. everyone else battles. Myself, I am waiting for actual use reports on the Wind before making a decision. Given HP’s miserable support for the Mini and the ridiculous “downgrade” policy to get XP, if Wind comes loaded with XP and a recovery disk, I think it could put a serious crimp in HP’s shorts. My wife doesn’t typically follow patterns, but I’ll ask her if she happens to remember the measurements she used for this case. As for the HP policy on Windows XP “downgrades,” I believe this is a result of a Microsoft policy, not HP’s. I suspect MSI will do something similar, requiring Windows users to pay for a Vista license to get an XP install disc. But I’d love to be proven wrong. So would I. Making people get Vista on a machine that is not designed for it makes no sense. These ULPC’s are tailor made for XP and it should hum along happily on them. Maintaining an onerous policy such as that on the Mini’s will not help Microsoft. If anything, I would think it only benefits the Linux community which now has an excellent opportunity to get that OS more into the mainstream. I use both MS Office 2003 and Open Office and have no difficulty switching between the two. It would not be difficult to switch completely to a Linux platform. I learned DOS and Windows, I should be able to learn Linux. By the way, it looks like the Mini and the Wind are about the same size, so your wife’s case may work for both. Best Buy sells cases for the 7-8 inch DVD players, as well as one’s for the 10inch DVD players. I bought one of these and it is a perfect fit for the HP 2133. The price is very reasonable, about $11 to $13.